Why A Duck? -- Who's Sorry Now? The pages under www.marx-brothers.org/whyaduck/ were originally created by Frank Bland for his site www.whyaduck.com. While I am just learning to smile. Whose heart is aching for breaking each vow? Just like I cried over you. I tried to warn you somehow. I'm glad that you're sorry now. And now you know just how it feels. The pages under www.marx-brothers.org/whyaduck were originally created by Frank Bland for his site www.whyaduck.com. Frank did kindly give me permission to use the contents of his site. 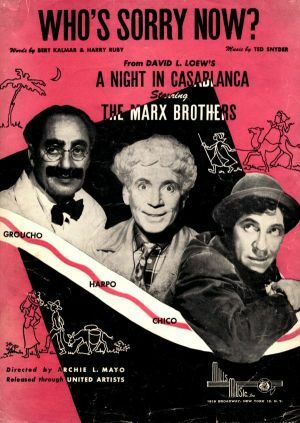 If you find text referring to "I" or "me" on pages under www.marx-brothers.org/whyaduck, this will usually refer to Frank.